Cabling crossbars are used to secure cables for all types of equipment. 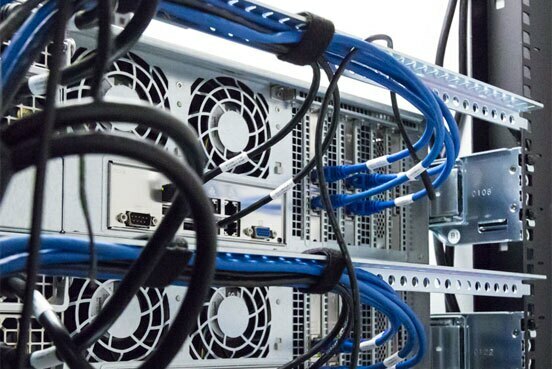 Cabling crossbars are typically used with equipment on static or non-sliding rails, but they can also be used on equipment with slide rails as long as the cables are disconnected from the equipment before the equipment is slid out. Cabling crossbars are available in several different types, depending on the amount of cabling to be secured. Heavy duty cabling crossbars are designed for UPSs that typically have large cables with no method to secure them. The smaller cable crossbars work well with 1U and 2U servers. This cable management option allows maximum use of the U space by occupying the unused rear uprights for cable management. Heavy Duty Cable Management Bar mounted on the top/back of an Open Frame Rack. Phillips head screwdriver required (except for tool-less model).